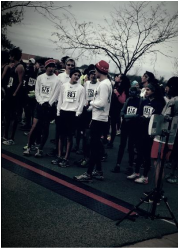 Here you can find information and updates on our running club. How can I be a part of this?As an Alumnus in good standing or current athlete of the program, you are already eligible to be a member. You can also be a member if you are an immediate family member of a current or former team member such as a parent or sibling of a current athlete on the OHS team. How can I show that I am a member? Go to our Apparel page to find out how you can order your own Team ROHO race singlet so you can compete as a member of the team. When can I wear the uniform of Team ROHO? As an Alum, you can wear it at any road race, open race, or in any race where you are not expected to represent your collegiate program. 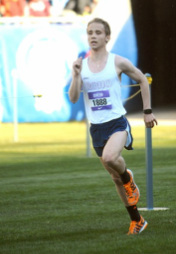 As a current member of OHS Distance Running Cross Country and Track teams, you are allowed to compete in it at any non-IHSA affiliated road, cross country, or track event. These events need to be out of the IHSA competition season. Team ROHO is on the scene! The new race singlets are out and in the hands of its members. Look for them this year in upcoming races, meets, and open competitions. It is never too late to be a part of the action. Help carry on the legacy of Oswego Panther Distance Running.